This coin commemorates the 125th anniversary of the establishment of the Nassau-Weilburg dynasty. 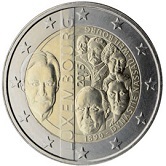 The coin is interesting and actually breaks the guide lines that came into force in 2013 that the outer ring was to contain only the twelve stars of the EU. It is divided in two by two parallel lines running from between six and seven o’clock at the bottom to between eleven and twelve o’clock at the top. Within these parallel running vertically is a bold inscription “LUXEMBOURG”. To the left of the parallel lines is the effigy of the reigning Grand Duke Henri. To the right of the parallel lines are the previous reigning Grand Dukes/Duchesses of the Nassau-Weilburg Dynasty. Starting from the top and going down we have – Adolphe, Guillaume IV, Marie-Adélaïde, Charlotte, Jean.